Five luxury hotel casino properties on the strip that get a lot of buzz as "THE place to stay in Las Vegas" are the Wynn and her new companion property the Encore, the Venetian and her companion Palazzo Las Vegas, and the Bellagio. If you find fault with the rooms in any of these places you probably need to get your head examined (or you are way too wealthy). Our Venetian king bed suite was even more splendid than the online photos suggest and an incredible bargain at the $109 "Twitter Special" rate offered there every few weeks. The beautiful bath complete with double sinks and a TV made this a splendid room but it was combined with a beautiful king sized bed area next to a sunken living room with a large couch, desk, and table. The room was spotlessly clean and elegantly appointed. Note as usual that if you can adjust your Las Vegas visits to mid-week where there are no holidays or major conventions you will enjoy a *huge* savings on luxury rooms which are often less than half the weekend costs. Even rooms of regular quality such as those at the older strip hotels like the Sahara or Tropicana are going to be cheaper mid-week. 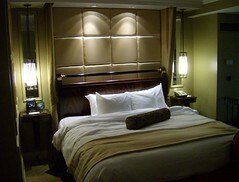 Where you should expect to pay $150 for the Venetian mid week you'll probably find rooms at the Sahara for under $50. Note though that Las Vegas mid week offers you the kind of luxury you can't enjoy elsewhere at any price, so I think a good "budget with style" strategy is to stay in luxury on weekdays and move to a modest priced hotel for the weekends. 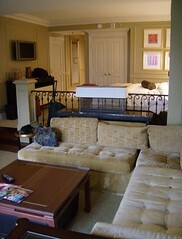 Our Suite at the Venetian in Las Vegas was really impressive with a sunken living room/office area below the bedroom. The bathroom was huge and elegant with two sinks, deep tub, shower, makeup corner. These suites are usually an amazing bargain Sun-Thursday but the price will rise to $250+ per night on the weekends. For a great vegas vacation get a good airline deal and go *mid week* to enjoy many of the same hotel amenities as the big players for about 1/2 the cost. This is a great shot taken by my friend Tom from *behind* the Bellagio Fountains inside the Bellagio looking out to Paris Las Vegas with Bally's on the left. 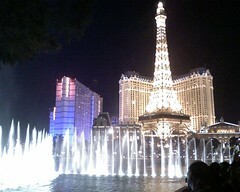 The Bellagio Fountains are one of the "must see" attractions when you are in Las Vegas with a spectacular water and music show throughout the day for most of the day through about midnight. Other amazing attractions inside the Bellagio are the nature conservatory, sculpted glass ceiling by Chiluly, a massive chocolate fountain, and Cirque du Soleil's spectacular show "O" where the performers constantly test the limits of human acrobatic magnificence with unbelievable jumps, dives, and synchronized acrobatics. This acrobatic and artistic virtuosity, combined with surreal imagery and music in one of the world's most sophisticated and ultra-engineered stage settings, makes "O" one of the world's most exciting and amazing stage shows.